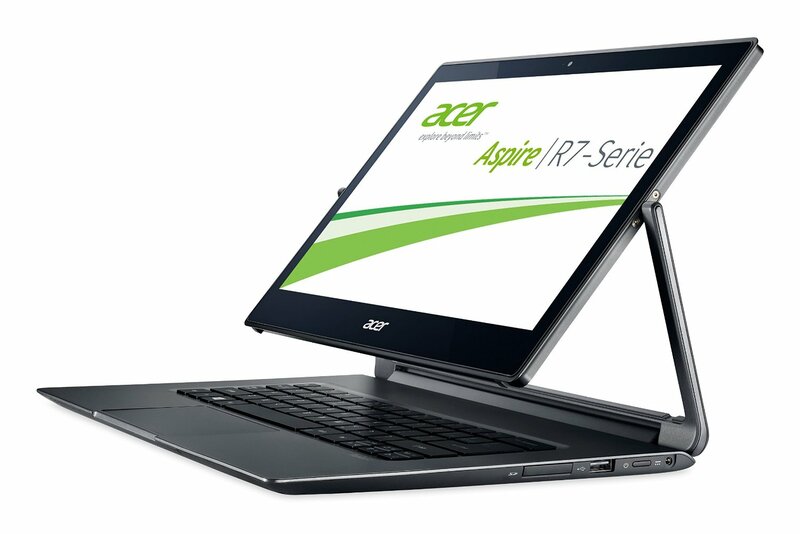 Earlier this year, Acer introduced a strange convertible ultrabook called the Aspire R7. 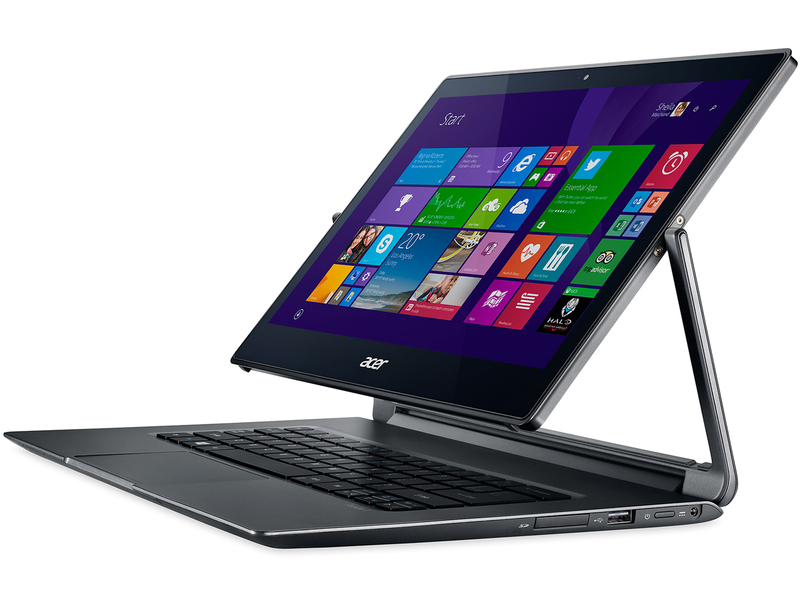 The new version of the Acer Aspire R7 isn’t much different from its predecessor. Yes, it’s a little slower and lasts quite a bit longer on a charge, but these differences are not so great that they change the character of the system. We’re definitely late to the party when it comes to reviewing the Aspire R7, but it’s still an interesting design and we thought it was at least worth a look before we move on. And moving on we are: part of the reason why I wanted to look at the Aspire R7 is that we’ve also got the Aspire V7 in hand, and the review is nearly finished. Acer's new convertible laptop certainly offers a much different approach with its actually good screen that allows for a wide range of adjustments. The hinge design works quite well and is built solid to hold up to the frequent use. The problem is that the design layout of the keyboard and trackpad make the system quite awkward to use in many configurations. 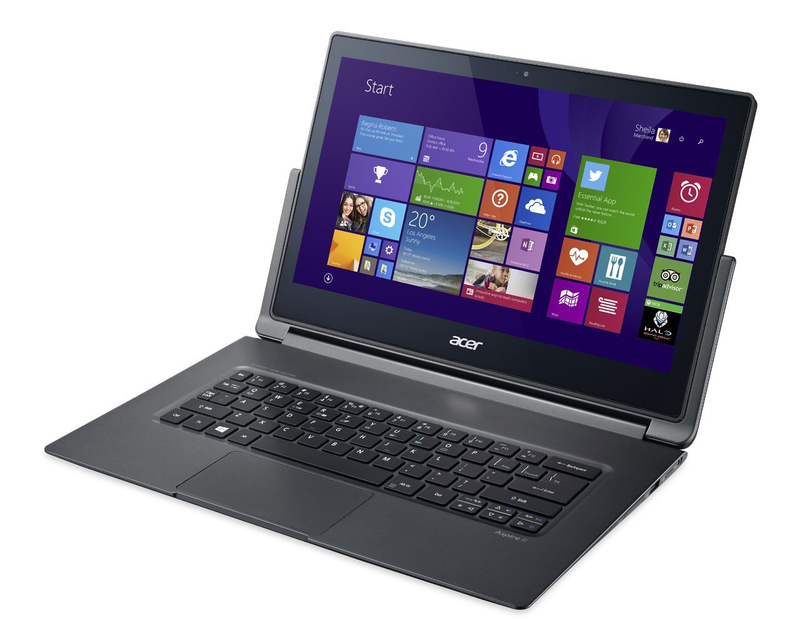 In the end, however, the Acer Aspire R7 is a high-flying concept brought low by reality. While the design is daring and innovative, even among the many experimental designs being tried with convertible and touch-centric laptops, the end user experience shows it to be deeply flawed. 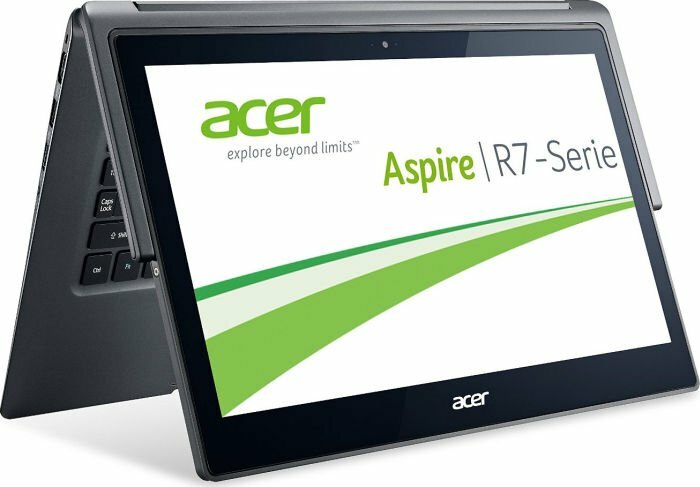 With a swapped keyboard and trackpad layout that proves cumbersome, a floating touch screen display that adds little, and a bulky design that reduces portability, the Aspire R7 is more of a weird-looking proof of concept than a marketable product, and the middling to mediocre performance just cements it further as a product that may look cool on the shelf, but isn't the one shoppers should spend their money on. 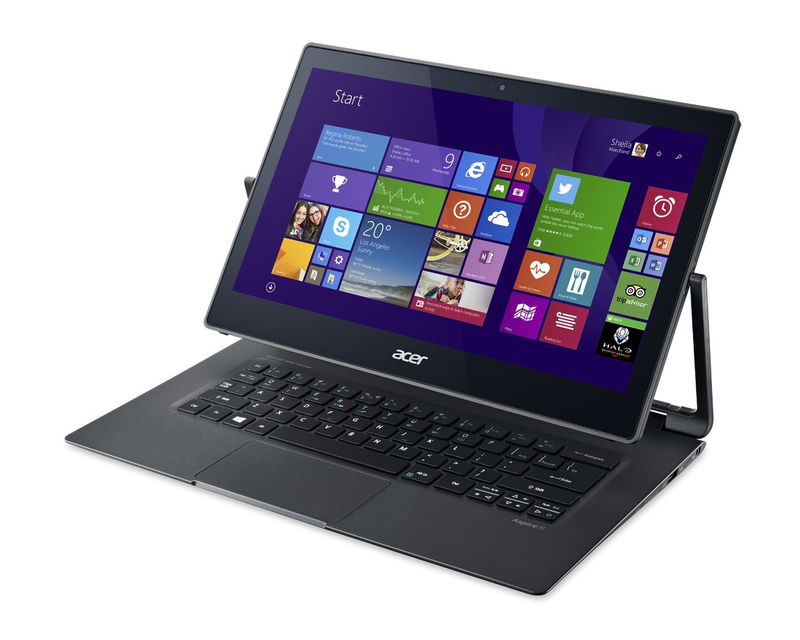 The Acer Aspire R7-571-6858 might be the first desktop replacement laptop for the all-in-one desktop generation. 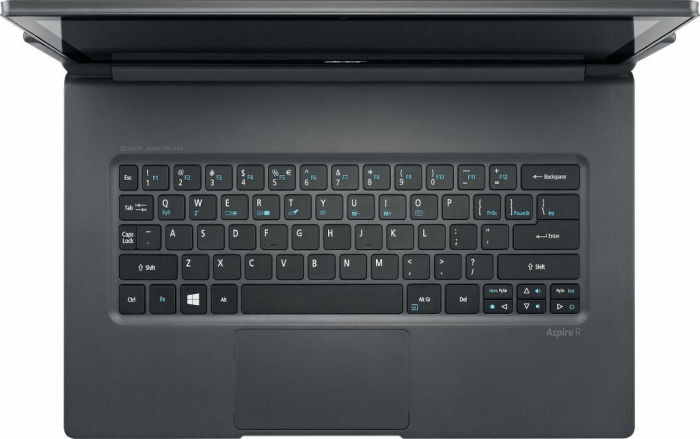 The Acer Aspire R7-571-6858 has an innovative hinge mechanism, but the overall design is dragged down by the decision to swap the touchpad and keyboard, resulting in a design that is awkward at best. 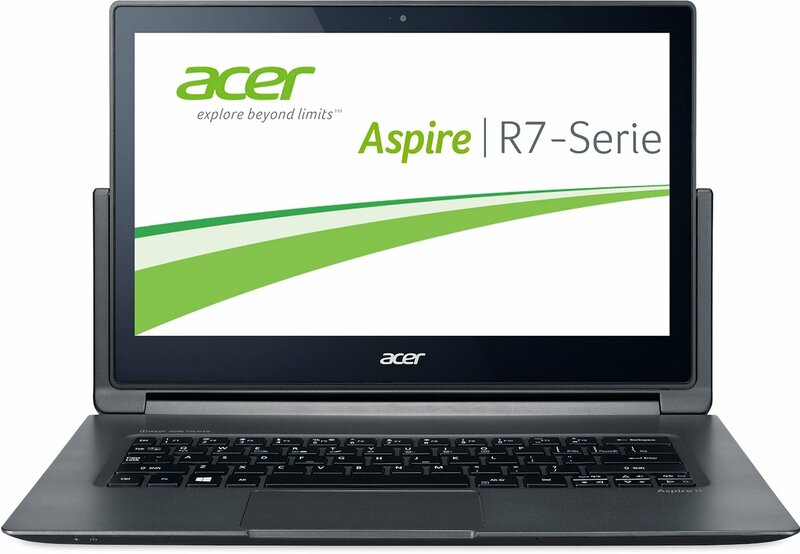 With its stellar-looking screen, stylish appearance, durable build, and decent battery life, the Aspire R7 holds its own as a contemporary touch-screen laptop. Throw in the extensive set of connectivity options, not to mention its decent performance, and we'd say the R7 is easily worth its purchase price. 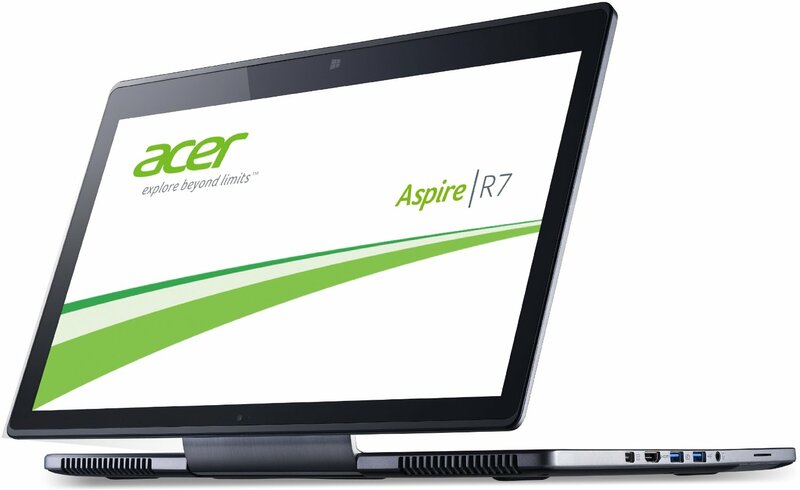 The Acer Aspire R7 is one of the most unique computers on the market today. Acer proves themselves as being not only a reputable traditional builder of notebooks with this device, but one that’s bold enough to create oddities like this as well. For that, Acer deserves to be commended. As far as how well this machine will serve the public in real-world use: that’s a bit more difficult to tell. This notebook is certainly one you’ll want to head into a showroom floor to have a go with before you purchase, that much is certain. It may turn out to be too strange for you to want to mess with: but it could very well surprise you as a bit of hardware that’s just what you need. We praise Acer for their innovation and the Aspire R7 has one of the cleanest hinge designs we've seen for a contortionist convertible. This is a good looking machine that's quick, cool and not noisy. It's the perfect family PC because it can be easily moved from room to room, yet the full HD 15.6" panel and loud stereo speakers offer a pleasing multimedia experience. If the R7 weren't well-built, it would appear to have a major identity crisis. But, happily, this machine is a success. Offering an innovative transforming design, a nice 1080p touchscreen and solid performance for $1,000 is no small feat. The device is hardly perfect, but for a gadget that spans the notebook, tablet and all-in-one categories, it's still fairly impressive. The $999 Acer Aspire R7 is definitely a unique device. We like its Ezel Hinge, which supports a wide range of motion and usage modes, and the display and audio are excellent. But the R7's keyboard and trackpad switcheroo ends up being more awkward than trendsetting, and the whole device is too heavy to be used as a tablet. In a year already filled with unusual computer designs, from laptops with slide-out keyboards to all-in-one desktops that double as coffee table displays, Acer deserves credit for coming out with something that stands out as very different. 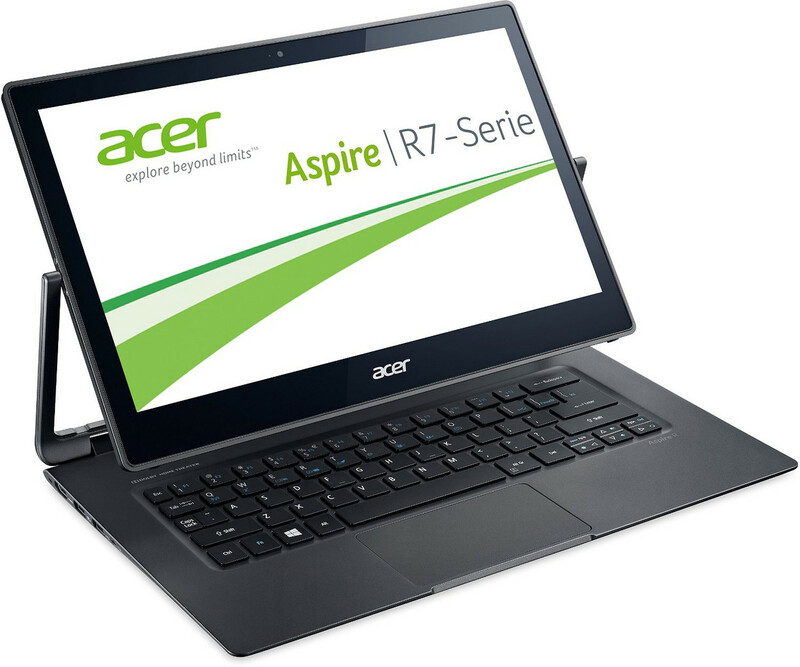 Acer deserves credit for trying new things in the ambitious Aspire R7. In December 2011, Acer’s CEO, J.T. Wang had an epiphany. 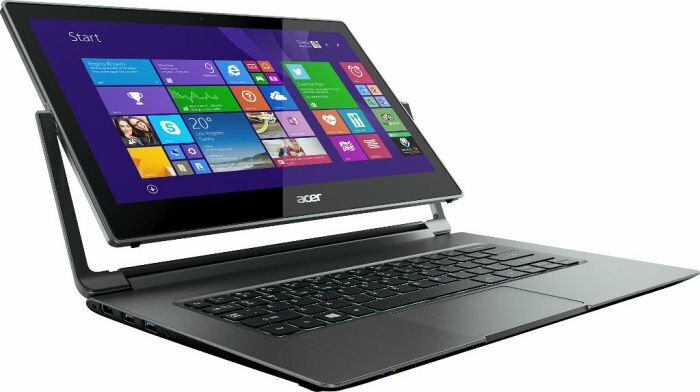 He told Dow Jones that his company would switch its strategy to improving profitability and stop “pursuing market share blindly.” The results of this decision became apparent within months, and now, a year and a half later, Acer has matured. 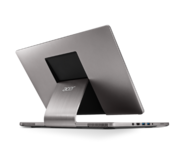 Once known as a company that builds bland, boring boxes, Acer has become a serious competitor in the hybrid and Ultrabook segments. 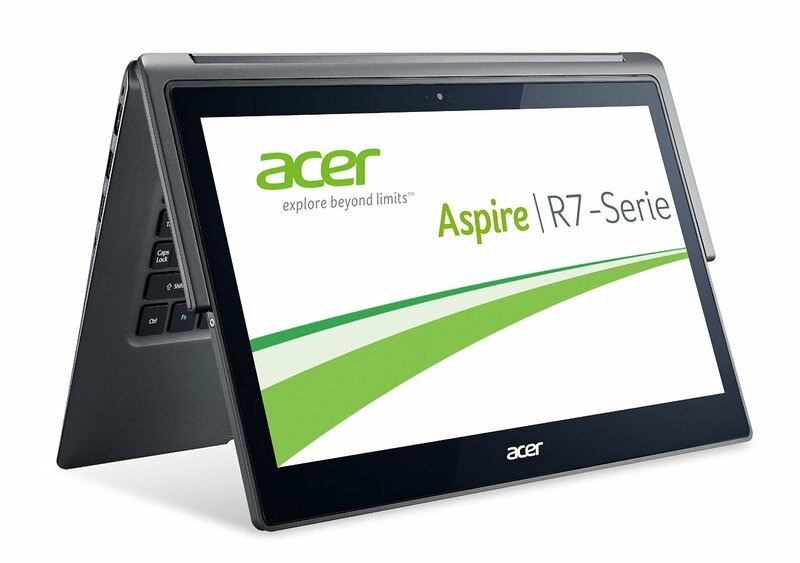 The Acer Aspire R7 is an innovative and powerful laptop that is completely geared up for touch. From our limited time with the notebook, we have to admit that we were impressed with it, but it has a couple of quirks that could be considered as flaws such as the track pad being positioned above the keyboard. Is it a laptop, is it a desktop? 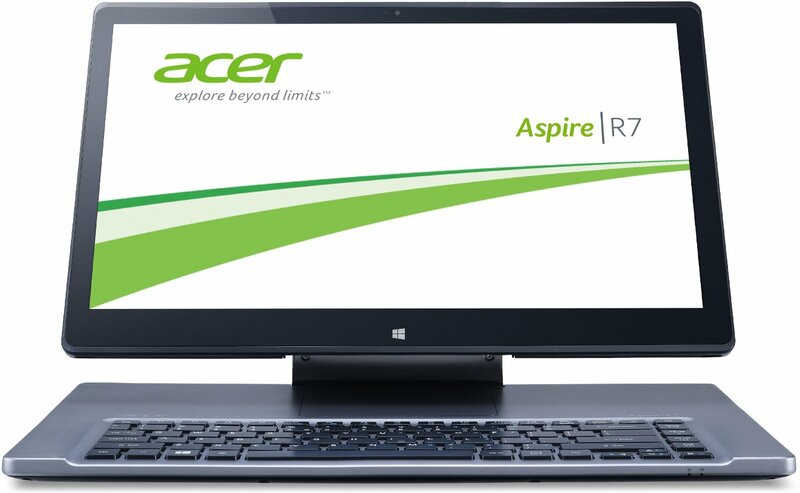 The Aspire R7 is one of the more unusual takes on the adjustable Windows 8 laptop that we've ever seen. No, scratch that, it's the most unusual take. The 15.6-inch adjustable laptop was on display at Acer's global launch event in New York city and Pocket-lint fought through the rabble to have a play with this topsy turvy PC. 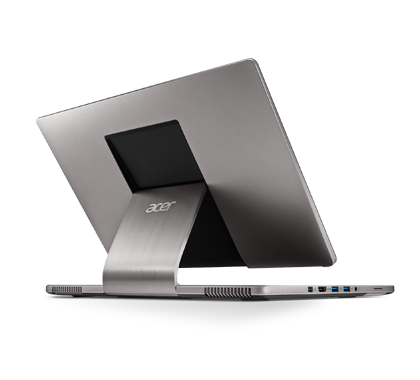 All things considered Acer is to be applauded for offering a different take on the laptop experience. Here there's a concerted and genuine attempt to be open, to embrace those that want a laptop, but to make it easy for people to use touchscreens. Part of Windows 8's rocky road has been due to an authoritarian dictation of how people 'should' use their laptops, such as removing the Start menu and putting Metro front and centre. The Acer Aspire R7 lets you work in nearly any way possible, and we're looking forward to putting it through its paces in a full review. Whether the Acer Aspire R7 is really going to prove a handy melding of laptop, desktop and tablet will only be revealed after prolonged real-life use. But the first impressions it leaves are positive. Clear thought has gone into its design and construction. There’s a definite learning curve to using the touchpad, and you can get more power for your money if you’re not in love with the curious design. However, this is worth keeping an eye on. With its 15.6-inch display and its ezel hinge, the Aspire R7 is rather heavy to the point where it feels like it would be better suited as a Windows desktop replacement rather than an actual portable notebook. Sure – you could carry the Aspire R7 around, but we have a feeling you’re not going to want to travel cross country with it in your bag. Aside from its weight, the display gave off a nice amount of brightness and detail. Positive: Modern looking; metal case; great Full HD display. Negative: Touchpad. Positivve: Impressive design. Negative: Position of the trackpad. This is ultimately what holds us back from wholeheartedly recommending the R7. While it is a real joy to use, and packs a decent enough punch for most users, it also comes with a pretty high pricetag. With that in mind, we can’t help but think that waiting a few months is going to be a better option than taking the plunge now and missing out on the longevity benefits of Intel’s new CPUs as well as the feature bumps being done by Acer itself. 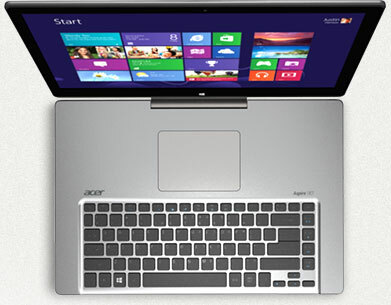 Acer's Aspire R7 challenges the concept of conventional notebook layout by placing the touchpad above the keyboard. Ultimately, it's what makes the R7 so hard to get used to, even after prolonged usage. We like its screen though, and the Ezel hinge allows it to be positioned in many interesting ways. Positive: Good design; good IPS-screen; powerful discrete graphics. 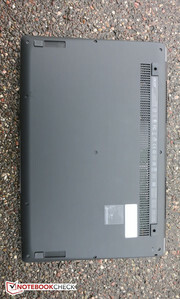 Negative: Uncomfortable touchpad and keyboard; short battery life. Positive: Good design; modern hardware platform; very good screen; good connectivity. Negative: Short battery life; heavy. 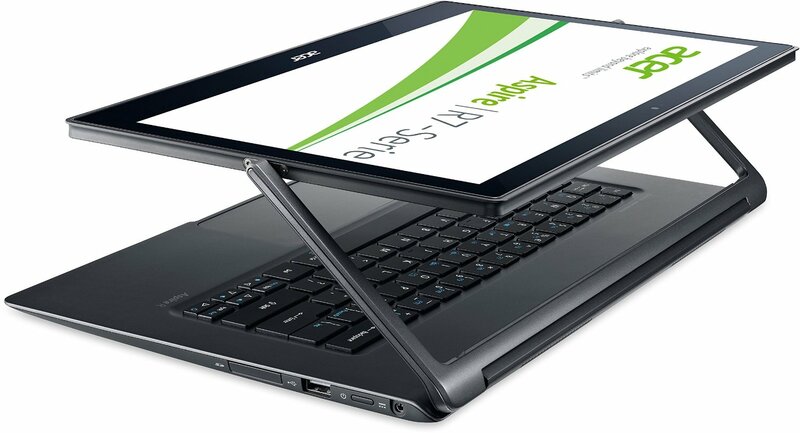 Positive: Nice material; special hinges, great keyboard and touchpad; convenient touch screen. 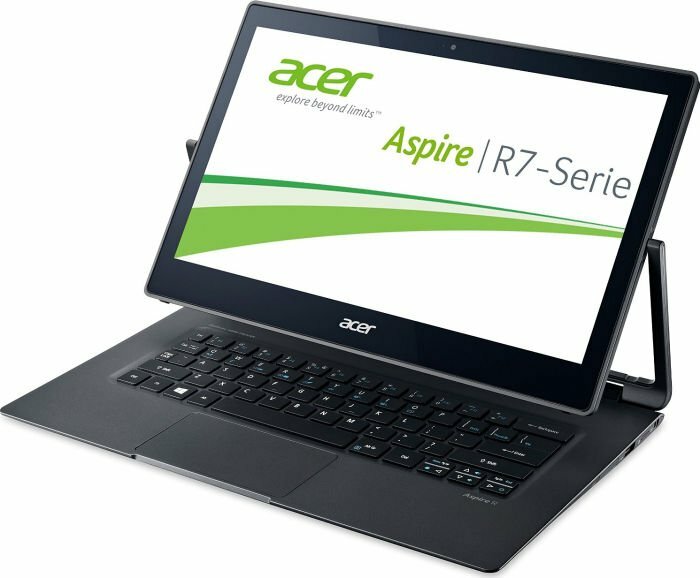 Acer hat mit dem Aspire R7 einen vielseitigen Rechner entwickelt, der die Ansprüche von Notebook, Tablet und All-in-One-Touch-PC erfüllt. Dazu musste der Hersteller jedoch ein paar Kompromisse eingehen, wobei vor allem die Positionierung des Touchpads oberhalb der Tastatur gewöhnungsbedürftig ist. Alles in allem ist das R7 ein gut ausgestattetes Mittelklasse-Gerät. 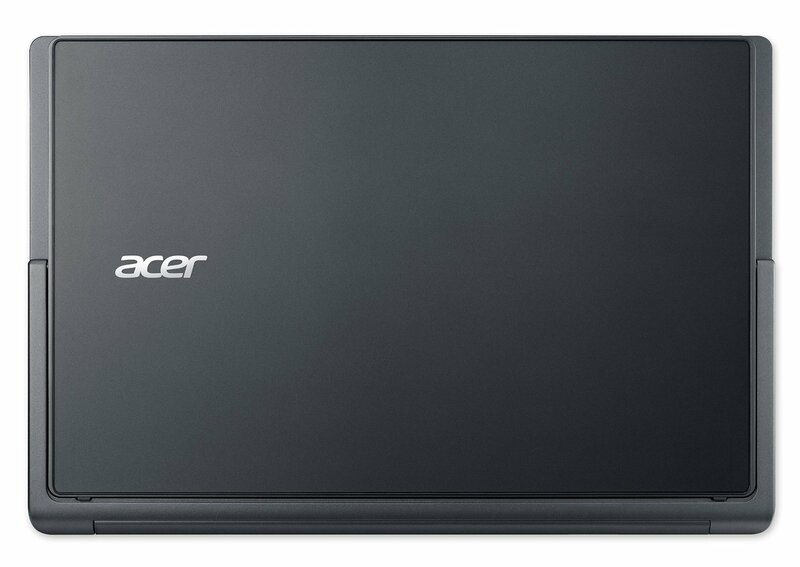 Durch die seltsame Scharnier-Konstruktion lässt sich das Acer Aspire R7 in der Praxis nicht bequemer nutzen. Aufgrund des schwergängigen Mechanismus werden Sie eher darauf verzichten, das Display zu verstellen. Abgesehen davon erweist sich das R7 nämlich als ordentliches Schreibtisch-Notebook: Der Bildschirm überzeugt ebenso wie die Tastatur, Tempo und Ausstattung sind noch ordentlich. 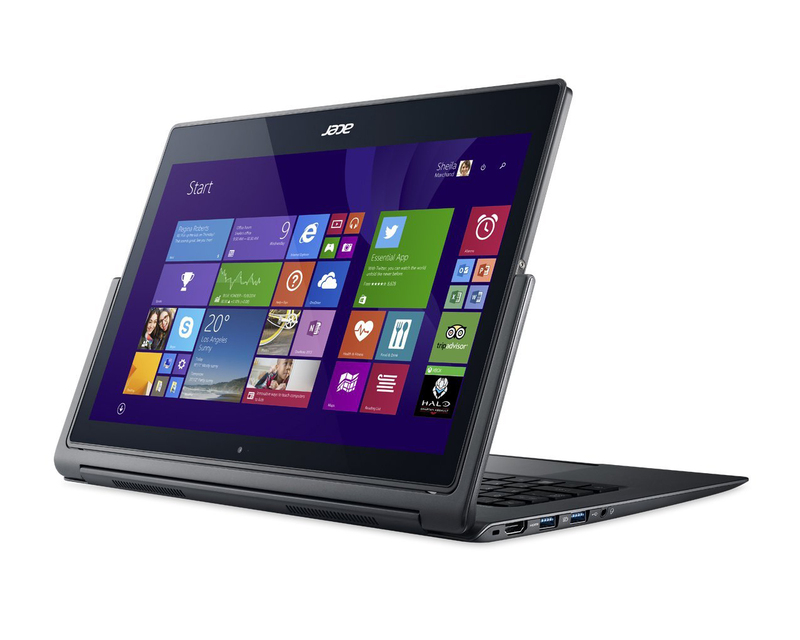 Das Acer Aspire R7 stellt eine interessante Herangehensweise an das Convertible-Konzept dar. Das riesige Scharnier macht das Notebook zwar schwerer und voluminöser, es ermöglicht aber vielfältige Positionierungen des Touchscreens. Die Stabilität des Scharniers ist gut, das IPS-Display überzeugt durch Blickwinkelstabilität, hohe Kontraste und akzeptable Helligkeit. Positive: Aluminum body; thin; convenient and high-quality keyboard; good display; good built-in speakers. Negative: Hot under load; strange location of the touchpad and keyboard. 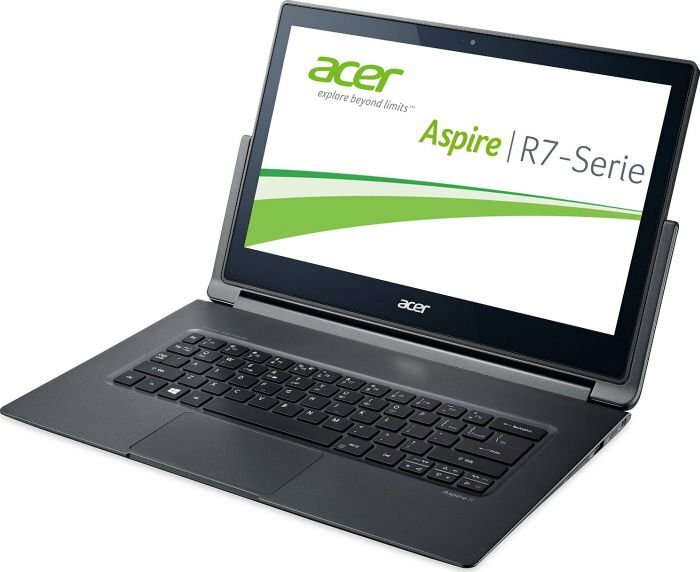 Acer is having its go at the convertible laptop with the Aspire R7, a 15.6" model that sports the firm's unique Ezel hinge. Acer deserves credit for breathing a little fresh air into the world of convertible laptop design. Unfortunately, its execution wasn't as good as its intentions. 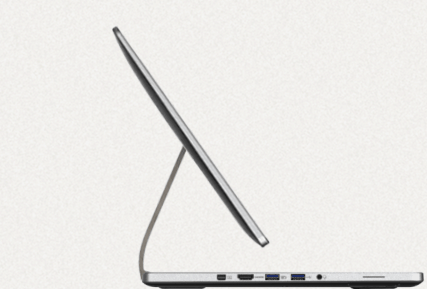 The body is a little awkward (what's with the touchpad? ), the body overheats and the sound quality needs improving. 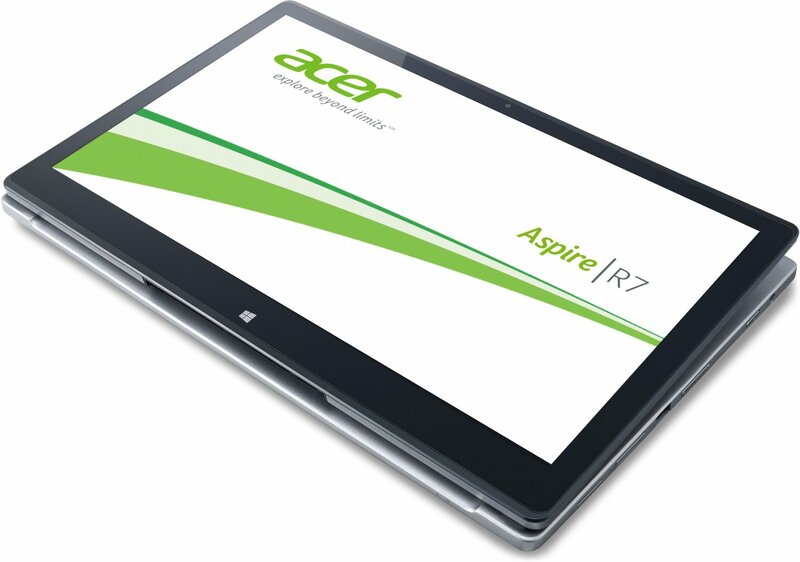 The original Aspire R7 had its share of problems, like middling performance. 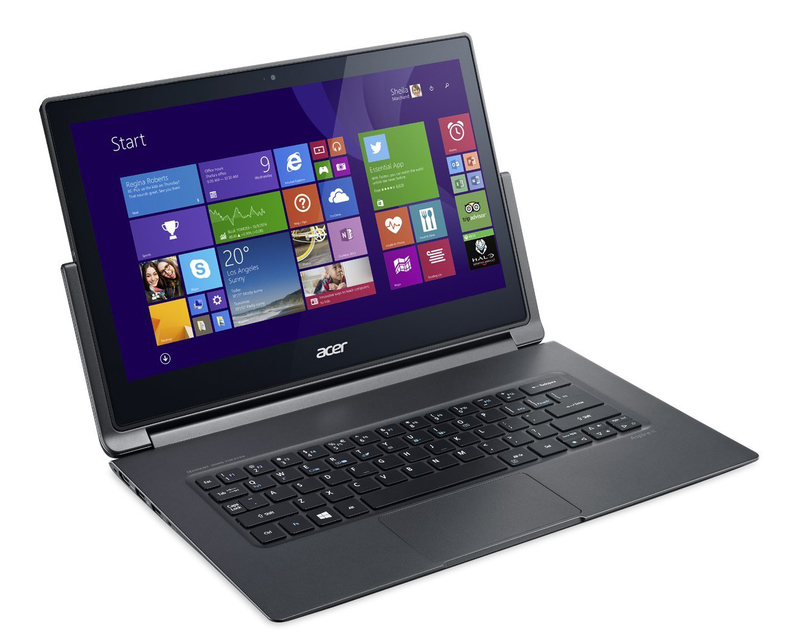 Some of those problems have been fixed with the Acer Aspire R7-572-6423. The new iteration also adds some desirable features, like N-Trig DuoSense technology, improved battery life, and a stylus for fine control. Unfortunately, no polished up feature set is enough to overcome the decidedly awkward design. 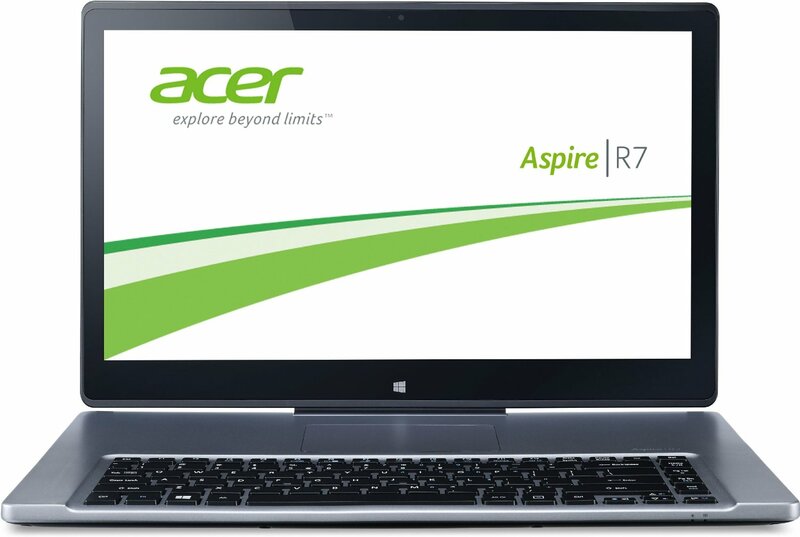 The original Aspire R7 had its share of problems, like middling performance. 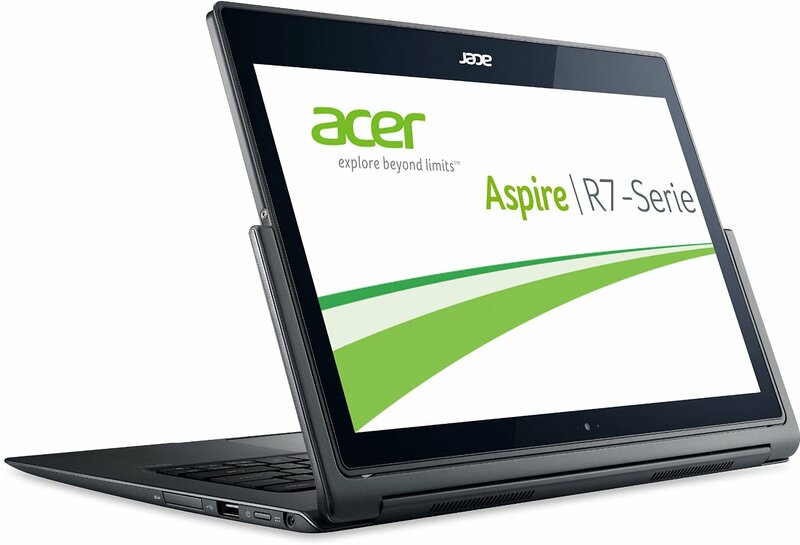 Some of those problems have been fixed with the Acer Aspire R7-572-6423. The new iteration also adds some desirable features, like N-Trig DuoSense technology, improved battery life, and a stylus for fine control. Unfortunately, no polished up feature set is enough to overcome the decidedly awkward design. The flipping display adds little to the touch experience, while the swapped keyboard and mouse certainly detract from the user experience at the most basic of levels. If you were intrigued by the original Aspire R7, then perhaps the improved R7-572-6423 is worth springing for, but on the whole, you'll do far better with the Asus N550JV-DB72T, our Editors' Choice for desktop-replacement laptops. Positive: Quiet operation; super IPS + display. Negative: Noisy under load; touchpad keyboard; uncontrollable dynamic contrast / brightness. Rechenleistung (30%): „gut“ (2,2); Handhabung (20%): „befriedigend“ (3,5); Display (15%): „gut“ (2,3); Akku (15%): „ausreichend“ (3,9); Umwelteigenschaften (10%): „befriedigend“ (3,0); Vielseitigkeit (10%): „gut“ (2,4). 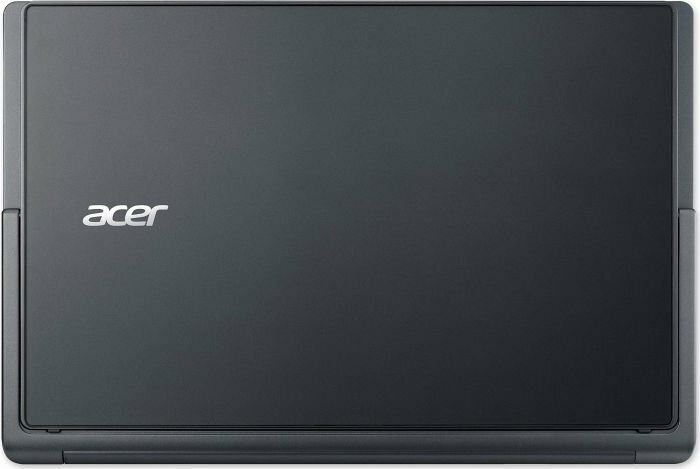 I have to commend Acer on trying something different with the R7, but it just might be that the laptop’s design is a bit far away from mainstream ones, which might make it difficult for people to warm up to. But if you’re willing to overlook the awkward trackpad/keyboard swap, you could do some pretty interesting things with the R7 and its various usability modes. 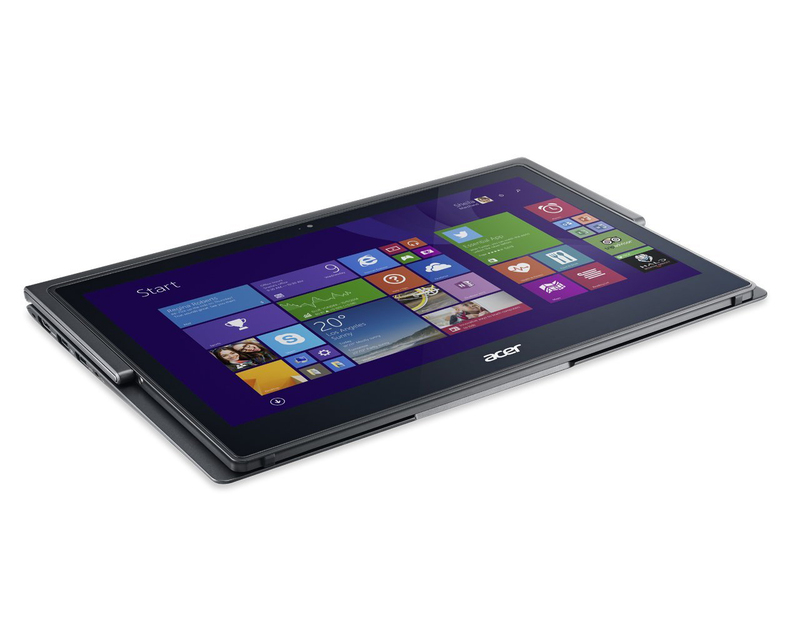 Das Acer Aspire R13 R7 ist ein Convertible, das sowohl als Tablet als auch als Laptop verwendet werden kann. Dank seines Ezel-Aero-Scharniers, kann der Bildschirm in sechs verschiedene Positionen gebracht werden, nämlich Stand-Modus, Tablet-Modus, Zelt-Modus, Ezel-Modus und Bildschirm-Modus. Jeder davon hat seine eigenen einzigartigen Merkmale, wobei der Bildschirm entlang seiner Längsachse gedreht werden kann. Der flexible Bildschirm ist 13,3 Zoll groß und bietet eine Auflösung von 2560 x 1440 Pixeln. Es handelt sich um einem Multi-Touch-Bildschirm, der bis zu 10 Fingerkontakte interpretiert. Das Gerät ist zirka 25,4 mm hoch, wiegt jedoch nur 1,5 kg. Da das Gerät fast vollständig auch Plastik ist, kann es trotz seiner Bauhöhe so leicht bleiben. Nur bei den beiden Balken, die den Bildschirm unterstützten, und beim Bildschirmrahmen wurde Metall verwendet. Der Prozessor ist ein Intel Core i7-4510U mit 2 GHz, der über eine Intel HD Graphics 4400 und 8 GB LPDDR3 RAM verfügt. Zudem gibt es einen Stylus, mit welchem man im Stand-Modus am Bildschirm kritzeln oder schreiben kann. Insgesamt gehört dieses Microsoft-Windows-8.1-Convertible möglicherweise zu den flexibleren Innovationen der letzten Jahre. Acers All-in-One. Ob Notebook, Tablet oder All-in-One PC. 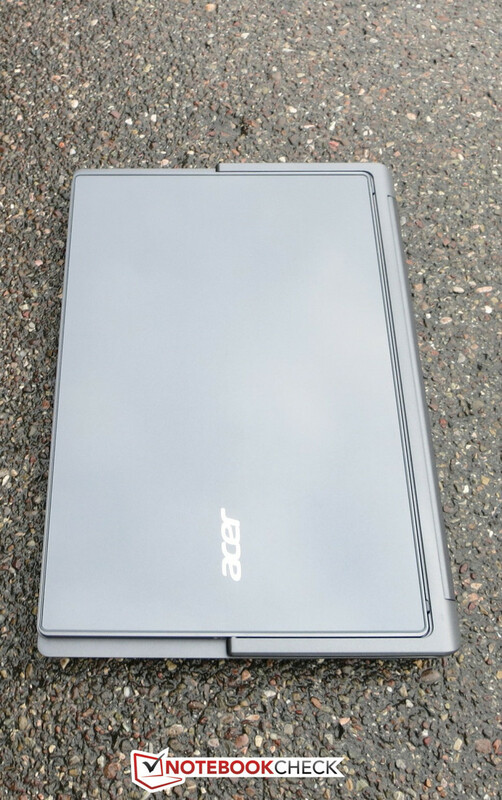 Das Acer R13 wird fast allen Anforderungen gerecht. Aufgrund neuartiger Scharniere Namens Ezel Aero Hinges kann das Gerät in alle möglichen Betriebsmodi versetzt werden und ist dank zweier Turbo-SSDs im RAID 0 Verbund und Intels i7-Prozessorserie dazu noch rasend schnell. Die Parallelen zum XPS 12 halten sich in Grenzen, das zeigt sich bereits nach wenigen Stunden. Denn wo Dell lediglich auf zwei verschiedene Display-Modi setzt, verspricht Acer gleich sechs. Ob man diese in der Praxis alle nutzt, ist fraglich. Klar ist jedoch, dass die Taiwaner die Idee der innerhalb des Scharniers drehbaren Anzeige aufgegriffen und weiterentwickelt haben. 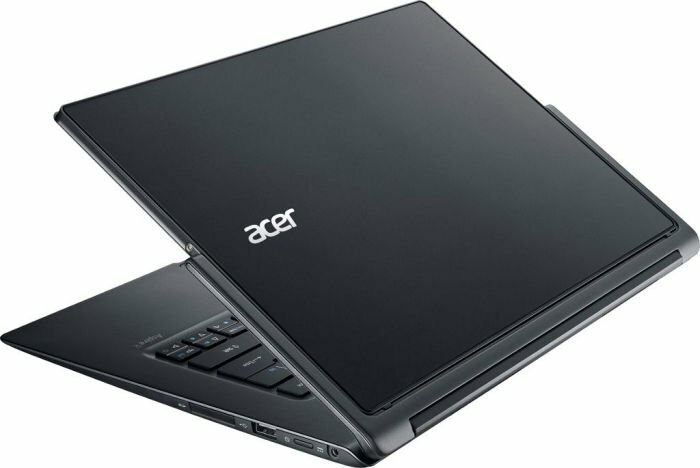 When it comes to redesigning the laptop to be a little more modernised, and more useful than just a typical clamshell computer, Acer’s take on the hinge is an interesting one, and was when the first model came to life in 2013. The latest take on it is even better, with a more portable design and some better innards, but we’re now stuck because the keyboard just stops this computer from being completely comfortable to use. The R13 is a marked departure from the R7. While the latter was more like a touchscreen all-in-one bundled into a notebook, the R13 is a true convertible designed for use as either an ultraportable laptop or a full Windows tablet. This will probably be less confusing for consumers and help to broaden its appeal. While the Yoga 3 Pro pushes the design envelope of 2-in-1s with its strikingly slim frame, Acer's R 13 focuses more on speed. The R13's combination of an Intel Core i7 CPU, 8GB of RAM and lightning-fast dual SSDs gives it a significant edge in power compared to Lenovo's flagship 2-in-1. The Aspire R13 is mainly designed for professional use with access to a wide variety of operating modes you will not find in any other device of this type. 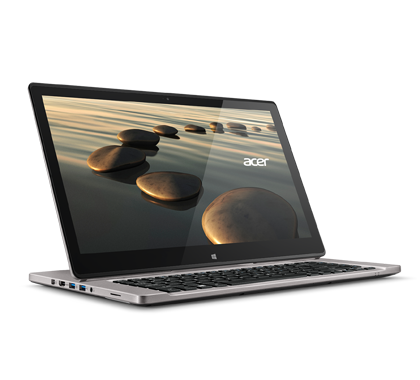 Acer has also packed a lot of features into a 13.3 inch device without making any sacrifices in performance. If you are looking for advanced features, impressive display technology, high performance, and versatility and you do not mind paying a little more, you may find the Acer Aspire R13 to be perfect for you. Positive: Reliable and convenient mechanism; comfortable keyboard with backlight; Stylus included; quiet cooling system; quality screen. Negative: Mediocre autonomy; poor speakers. Positive: Practical convertible design; good performance; nice QHD display (2560x1440); stylus pen. 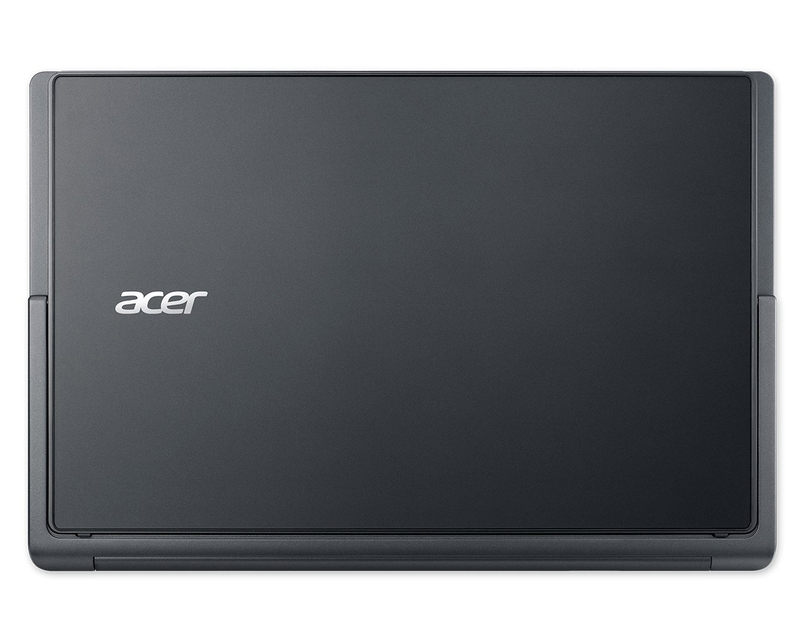 Das Acer Aspire R7-371T-55DJ ist auf hohe Leistung und flexible Verwendung ausgerichtet. Laut Acer ist es wandelbar, vielseitig und gut gebaut, doch es wirkt so als wäre es etwas schwierig sich mit dem Bildschirmdeckel anzufreunden. 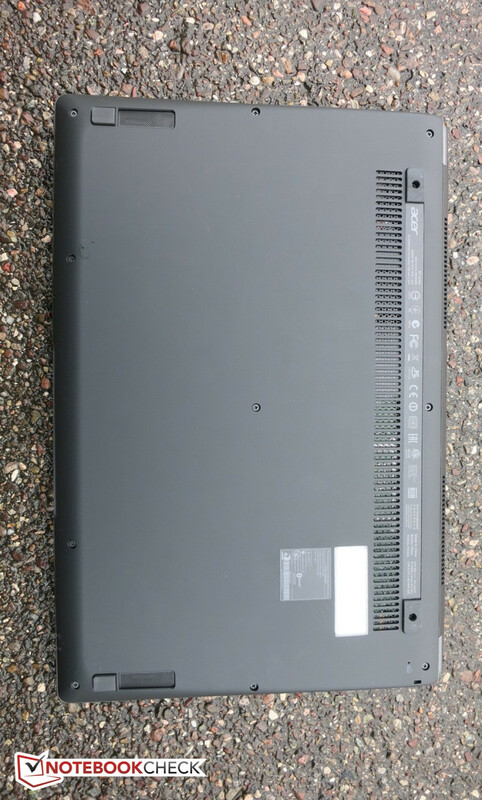 Das Convertible eignet sich für Business-User, welche sich nach einem kompakten, leichten und gut gebauten Laptop umsehen. Es verfügt über Windows 8.1 Pro 64-bit, eine 2,7 GHZ Intel Core i5 4210U CPU, 8 GB DDR3 RAM, eine Intel HD Graphics 4400 und eine 256 GB SSD. Sein 13,3 Zoll großer Full-HD-Bildschirm bietet angenehme Blickwinkel und unterstützt Multi-Touch-Eingaben. Dank Gorilla Glass 3 ist der Bildschirm kratzfest und die Bildschirmbeschichtung verringert Spiegelungen effizient, sodass sich das Gerät für Verwendung im Freien eignet. Auf der Chiclet-Tastatur mit Hintergrundlicht lässt es sich angenehm und erfreulich leise tippen und das Touchpad ist ziemlich reaktionsfreudig. Da Acer nicht auf LED setzt, ist das Hintergrundlicht nicht besonders hell. Das Aspire R7 bietet wegen seiner Bauhöhe keinen DVD-Brenner, doch ein Kartenleser ist an Bord. Der Laptop verfügt über zwei USB-3.0-Ports, einen USB-2.0-Port, einen HDMI-Port, eine Kopfhörerbuchse, eine Mikrofonbuchse und eine HD-Webcam. Sein Gewicht von 1,47 kg ist angenehm und die Akkulaufzeit beträgt wie von Acer versprochen bis zu 7 Stunden. Laut einen der Tests kann es bei minimaler Helligkeit bis zu 15 Stunden durchhalten. Das leuchtstarke Full-HD-Display mit IPS-Panel ist horizontal drehbar in einem U-förmigen Rahmen aufgehängt und lässt sich in beliebiger Position verwenden. ... Der Intel Core-i5-4210U kann auf 8 GByte RAM zugreifen und sorgt mit einer schnellen 256-GByte-SSD für eine gute Systemleistung und eine für ein Ultrabook passable 3D-Performance. Acers Aspire R 13 ist flott und günstig. Allerdings ist es für ein Ultrabook recht sperrig. Acers R13 ist recht leicht, bietet eine lange Akkulaufzeit und ist solide verarbeitet. Obendrein ist sein Arbeitstempo hoch und die Ausstattung mit zwei USB-3.0-Buchsen, schnellem WLAN-ac und stromsparendem Bluetooth 4.0 nahezu komplett. Die vielseitigen Einsatzmöglichkeiten des R13 lässt sich Acer aber mit 999 Euro sehr teuer bezahlen. 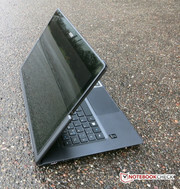 Das Aspire R 13 ist schick, schnell und vielseitig. Die Ausstattung ist sehr gut, der Preis von 1000 Euro mehr als angemessen. Den Stift hätte sich Acer aber sparen können. Das Acer Aspire R7-371T-55DJ überzeugt im Test mit ausgefallenem Convertible-Design, ansprechender Ausstattung und einer vollwertigen SSD für Top-Performance. Zusammen mit den starken Laufzeiten hievt sich das 13,3-Zoll-Notebook auf den ersten Platz der Bestenliste. Der faire Preis sorgt zudem für ein starkes Preis-Leistungs-Verhältnis. 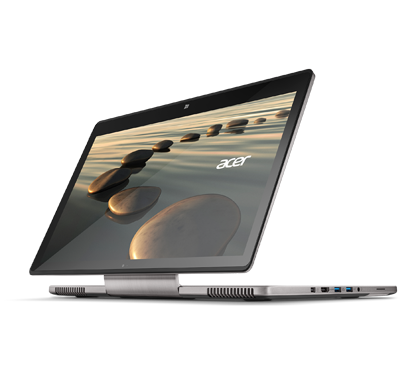 In unserem Test erleben wir das Acer Aspire R7-371T-55DJ als ausdauernd, hell, performant und auch solide gebaut. So muss ein portables Notebook in dieser Preisklasse aussehen, das Sleeve und der Stylus werten das Gesamtpaket ordentlich auf. Der Touchscreen und die Stifteingabe machen Spaß, auch wenn wir die 6 Betriebsmodi nicht wirklich ausreizen und den Stylus nur selten zücken. 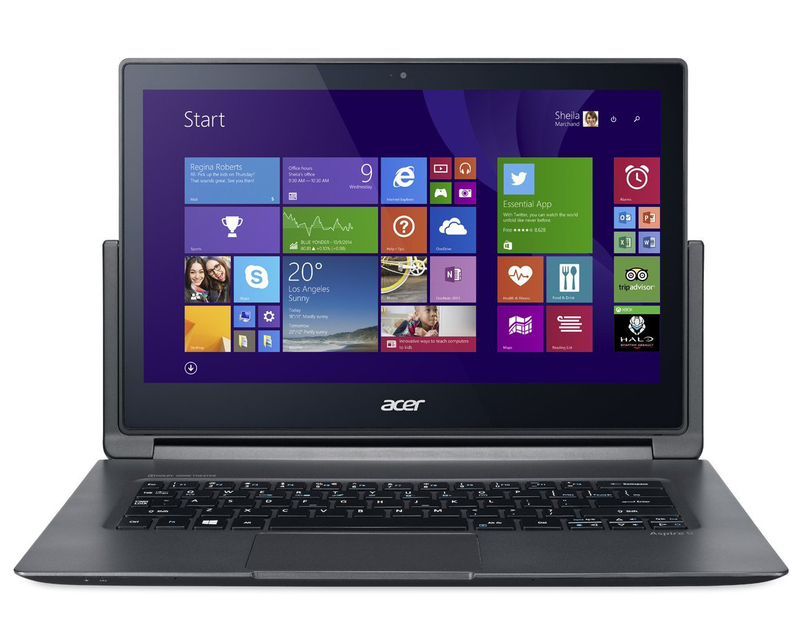 The Acer Aspire R13 is an excellent laptop, but it may not the best choice for every consumer. 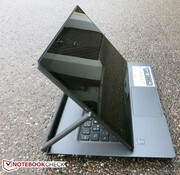 This notebook is well built, but the display lid can be difficult to grasp, and the machine is noticeably heavier than many of its Intel Core M counterparts. The Aspire R13 also isn’t the greatest when it comes to enjoying multimedia content. The display’s color accuracy is good, but it wasn’t as bright as we would have liked and the audio quality from the built-in speakers was inconsistent. Das Acer Aspire R7-371T-72TC ist ein Hybrid-Laptop für User, denen Vielseitigkeit wichtiger als Leistung ist. Dank leichtem und schlankem Design kann das Gerät angenehm transportiert werden und als Tablet oder Laptop verwendet werden. Der Hybrid-Laptop wiegt 1,5 kg und die maximale Bauhöhe ist knapp über 17 mm. Der 13,3 Zoll große Multi-Touchscreen löst mit 2560 x 1440 Pixeln auf und oberhalb dieses befindet sich eine Webcam. 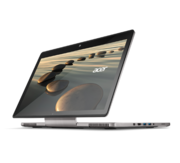 Das Aspire R7 ist mit einer Intel Core i7-4510U CPU mit einer Taktrate von 2 GHz, 8 GB RAM und WiFi ausgestattet. Als Speicher steht eine SSD mit 512 GB zur Verfügung, doch ein optisches Laufwerk fehlt. Trotz schlanker Bauweise bietet dieser Hybrid-Laptop insgesamt drei USB-Ports (ein USB-2.0, zwei USB-3.0) und einen SD-Kartenslot. Zudem verfügt er über einen HDMI-Port in Vollgröße und eine Kopfhörerbuchse. Die Tastatur mit Hintergrundlicht verbessert das Aussehen und kann angenehm im Dunklen benutzt werden. Laut Acer beträgt die maximale Akkulaufzeit ungefähr 7 Stunden. Wie bei dem meisten Laptops sollte man sich jedoch nicht erwarten, dass das für tatsächliche Verwendung gilt. Das Acer Aspire R7-371T-72TC läuft unter der 64-bit-Architektur von Windows-8.1, das sehr benutzerfreunndlich für Touchscreen-Konfigurationen ist. 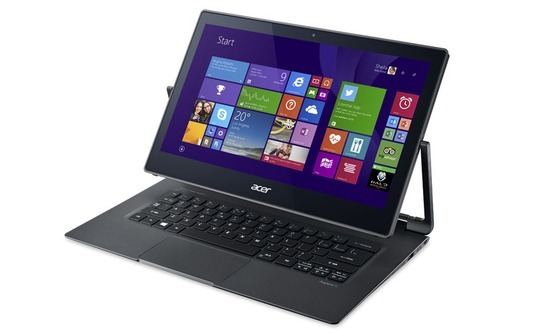 The Acer Aspire R 13 (R7-371T-72TC) is at the vanguard for thin-and-light laptops that offer convertible screens. Its unique hinge gives you a little more versatility than the dual-hinge flipping displays of similar systems. You get good performance and lots of storage space, but the R 13 is expensive for what it offers, and battery life is hours short of its rivals. The Lenovo Yoga 3 Pro holds on to its Editors' Choice for high end convertible-hybrid laptops because of its longer battery life, smaller chassis, lighter weight, and higher-resolution (3,200-by-1,800) screen, all for $200 less. Das Acer Aspire R13 R7-371T-52JR zeigt im Test ein ganz ähnliches Bild wie R7-Vorgänger, inklusive Tablet-Option und hochpreisiger Ausstattung. Im Vergleich zum R7 trumpft das R13 daneben mit einem besseren Display und einer neueren CPU auf – verliert aber zugleich Punkte in Sachen Ergonomie. Als Negativa stehen lediglich die geminderte Outdoor-Tauglichkeit, der maue Sound und die etwas magere SSD-Kapazität zu Buche. Das alles sind jedoch klassentypische Kritikpunkte, die kaum ein Konkurrent bei vergleichbarem Preispunkt besser meistert. Das Einzige, was mich letztlich wirklich vom Kauf abgeschreckt hat, war meine Unschlüssigkeit, ob mir 13,3 Zoll ausreichen. Der Mobilitätsfaktor ist natürlich hervorragend, aber irgendwie bin ich noch immer ein 15-Zoll-Verfechter. Also warte ich auf das nächste spannende Konzept – oder meine 13-Zoll-Läuterung. While the base configuration delivers great price to performance value, what makes the Aspire R13 unique is its multimodal design. With more expensive configurations of the Aspire R13 - unless you need the multimodal computing experience Acer is selling - you may find better value in a fully configured Dell XPS 13 or Surface Pro 3, the former offering a more compact frame while the latter delivers a lighter body for use as a tablet with an optional keyboard to transform it into an Ultrabook. 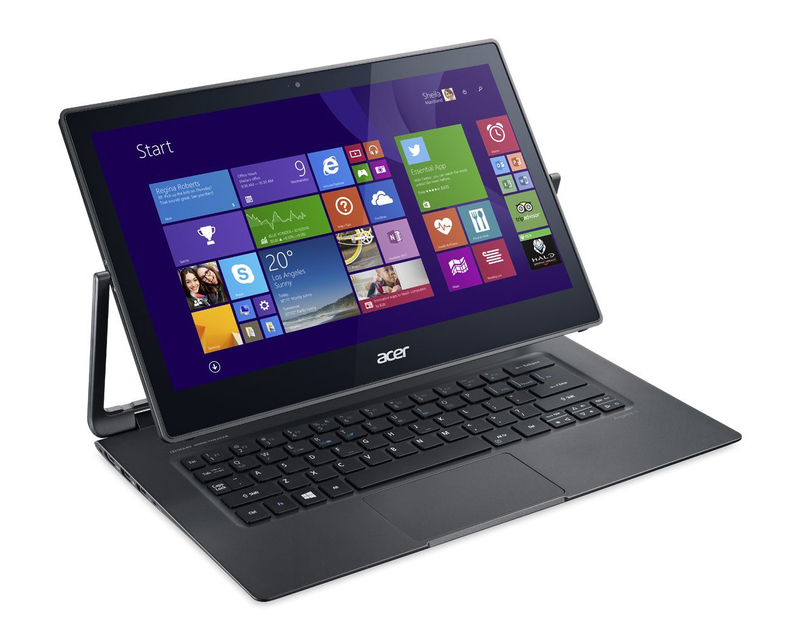 Das Acer Aspire R7-371T-78UV ist ein Convertible-Laptop, der leicht zu transportieren ist und auch als Tablet fungiert. Das Design ist einfach und elegant gehalten, wobei das gesamte Gerät eine metallische, dunkelgraue Oberfläche aufweist. Sogar der Bildschirmdeckel sieht mit nur dem Acer-Logo links zentriert minimalistisch aus. Was ein erfolgreiches Convertible ausmacht, ist die Einfachheit und Robustheit des Scharniersystems. Acer hat die Acer-Ezel-Hinge-Lösung implementiert, die hochwertig und stabil ist. Der 13,3 Zoll große WQHD Active Matrix TFT LCD wird durch Corning Gorilla Glas geschützt. Die Bildqualität ist gut und die Multi-Touch-Funktionalität reaktionsfreudig, was besonders im Tablet-Modus nützlich ist. Das Windows-8.1-Gerät verfügt über einen Intel Core i7-5500U Dual-Core-Prozessor mit einer Taktrate von 2,40 GHz, 8 GB LPDDR3 RAM, eine Intel HD 5500 GPU und eine 256 GB SSD. Zu den weiteren Features zählen ein Kartenleser, ein HDMI-Ausgang, zwei USB-3.0-Ports, ein USB-2.0.Port und eine Webcam. 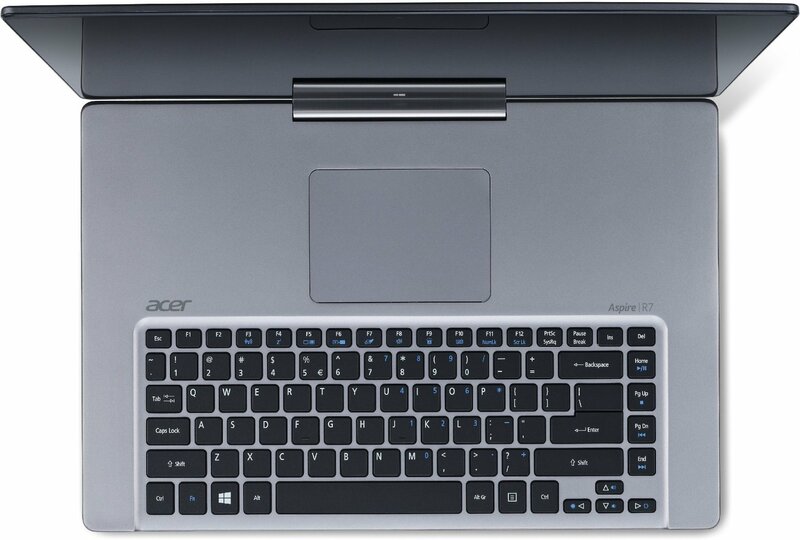 Das Acer Aspire R7-371T-78UV bietet eine Tastatur mit Hintergrundlicht, dessen Helligkeit automatisch an die Umgebungshelligkeit angepasst werden kann. Die Akkulaufzeit ist beeindruckend. Das Tablet hält mit dem 4-Zellen-Lithium-Ionen-Akku mit einer Nennkapazität von 3200 mAh bis zu 9 Stunden durch. After spending time with the Acer Aspire R 13, we are impressed by the Ezel Aero Hinge that enables the R 13 to function in six different modes. 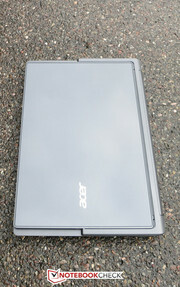 You can tell Acer focused on the details of this hinge and the overall design engineering of the machine. These little details make a big difference in how the different modes feel and function. With a better keyboard, this machine would serve so many different needs. However, people who type for a living or who do a lot of typing for their personal use will want to look at another system. High end gamers will need dedicated graphics, something this machine doesn’t give them. However, most people will think this machine gives them enough power for the average tasks, for entertainment and even some light pro-level media creation purposes. Positive: Decent hardware; very good display; good sound system; good input device. Negative: High price; thick and heavy. Positive: Good design; quality build; decent hardware; long battery life. Negative: Uncomfortable keyboard. Though it’s not the first company to employ a dual-hinge display mount, (Dell’s XPS 12 ultrabook convertible employs the same basic idea), Acer’s take on it is superb. 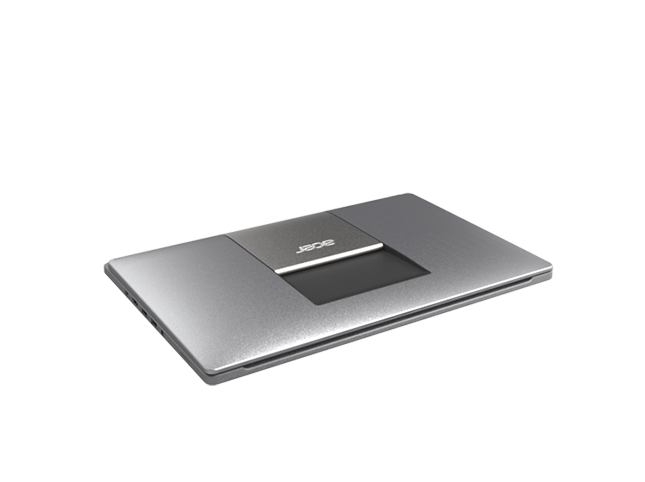 Acer calls it the Ezel hinge and has trademarked the name. OK. I particularly like the way the design lets you scoot the display forward for closer viewing while still maintaining a decent viewing angle and unfettered access to the keyboard. Acer has produced some winning laptops as of late, including its R 11 Chromebook, and the R 13 is no exception. This laptop has a very unique design that will turn heads, but it's not just about looks -- the design makes the laptop functional in a way that a traditional laptop isn't, arguably more functional that the popular fold-all-the-way back displays. If you find yourself unable to find the perfect chair height/screen angle for your desk, the R 13 is a godsend. 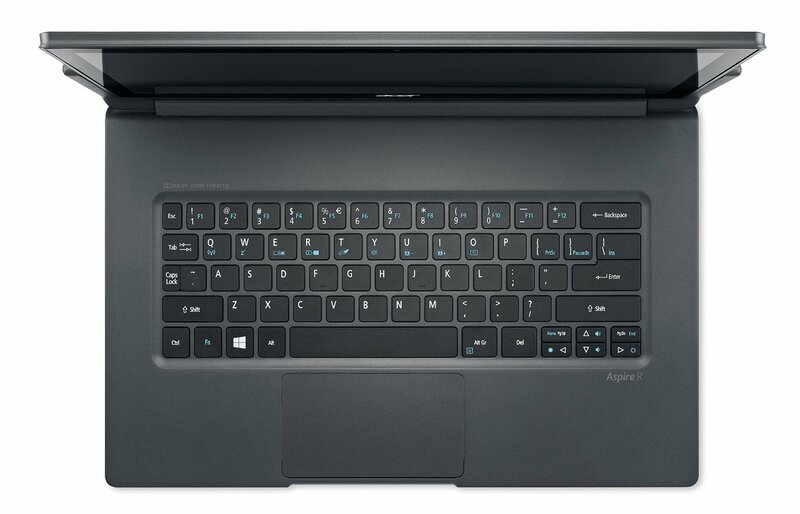 The Acer Aspire R 13 (R7-371T-50ZE) has a unique and versatile hinge that sets it apart from the other convertible-hybrid laptops on the market. Its battery life in testing is one of the longest we've seen on any Windows hybrid, including the detachable tablets. And its touch screen is bright and has wide viewing angles. Still, the HP Spectre x360 13t (13-4003) remains our Editors' Choice for midrange convertible-hybrid laptops thanks to its wider port selection, larger touchpad, and lack of bloatware. That said, the Aspire R 13's excellent battery life is a selling point, so if the Ezel-hinge design appeals to you, it's a midrange convertible-hybrid laptop worth considering. Positive: Practical convertible design; excellent performance; nice display. Vielseitigster Hybrid im Test. Einer von zwei Hybriden mit guter Note bei 3D-Spielen. Spiegelndes Full-HD-Display lässt sich über die Tastatur klappen. Zeigt Farben mitunter verfälscht an. Zwei SSD-Speicher. Sehr geringer Stromverbrauch. 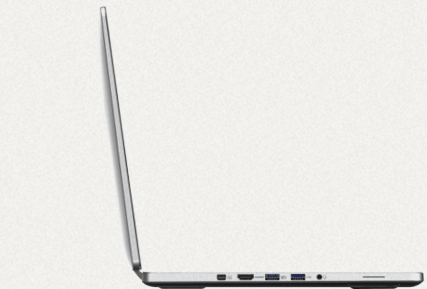 Mit USB 3.1 Typ C.
Positive: Impressive design; excellent display; decent autonomy. Negative: Relatively high price. Intel HD Graphics 4000: In Ivy Bridge Prozessoren (3. Generation Core) integrierte Grafikkarte in höchster Ausbaustufe. Je nach Prozessor (ULV bis Desktop Quad-Core) unterschiedlich getaktet.Intel HD Graphics 4400: In den Haswell-Prozessoren (4. Generation Core) integrierte Grafikkarte in mittlerer Ausbaustufe (GT2). Je nach Prozessor unterschiedlich getaktet.Intel HD Graphics 5500: Integrierte Grafikkarte (GT2), welche in einigen Broadwell-ULV-CPUs (15 Watt TDP) verbaut wird.Diese Grafikkarten sollten alle modernen Spiele flüssig darstellen können. Anspruchsvolle Spiele müssen jedoch in mittlerer Detailstufe gespielt werden. Ältere und weniger anspruchsvolle Spiele wie die Sims Serie können auch in hohen Detailsstufen flüssig dargestellt werden. NVIDIA GeForce GT 750M: Schnelle Mittelklasse-Grafikkarte der GeForce-GT-700M-Baureihe. Basiert auf der Kepler-Architektur und wird von TSMC in einem 28-nm-Prozess gefertigt.Diese Klasse ist noch durchaus fähig neueste Spiele flüssig darzustellen, nur nicht mehr mit allen Details und in hohen Auflösungen. Besonders anspruchsvolle Spiele laufen nur in minimalen Detailstufen, wodurch die grafische Qualität oft deutlich leidet. Diese Klasse ist nur noch für Gelegenheitsspieler empfehlenswert. Der Stromverbrauch von modernen Grafikkarten in dieser Klasse ist dafür geringer und erlaubt auch bessere Akkulaufzeiten. 4500U: Auf der Haswell-Architektur basierender ULV Dual-Core Prozessor mit integrierter Grafikkarte und DDR3-Speicherkontroller.4510U: Auf der Haswell-Architektur basierender ULV Dual-Core Prozessor mit integrierter Grafikkarte und DDR3-Speicherkontroller.5500U: Auf der Broadwell-Architektur basierender, sparsamer ULV-Prozessor für kompakte Notebooks und Ultrabooks. Integriert unter anderem zwei CPU-Kerne sowie eine Grafikeinheit und wird in 14-Nanometer-Technik gefertigt.6500U: Auf der Skylake-Architektur basierender ULV-SoC (System-on-a-Chip) für schlanke Notebooks und Ultrabooks. Integriert unter anderem zwei CPU-Kerne sowie eine Grafikeinheit und wird in 14-Nanometer-Technik gefertigt. 74.11%: Diese Bewertung ist schlecht. Die meisten Notebooks werden besser beurteilt. Als Kaufempfehlung darf man das nicht sehen. Auch wenn Verbalbewertungen in diesem Bereich gar nicht so schlecht klingen ("genügend" oder "befriedigend"), meist sind es Euphemismen, die eine Klassifikation als unterdurchschnittliches Notebook verschleiern.» Lesen Sie auch unsere Notebook-Kaufberatung.